The original two story building was built by Dr. Willis Cannon, a pharmacist/ doctor/ banker. J.H. (Harve) Rice purchased the building from Dr. Cannon to start his undertaking business. The facility has undergone three expansions since the original structure was built. In 1909, Fred Simmons bought the Gremmel Mortuary and furniture store in Kensington. 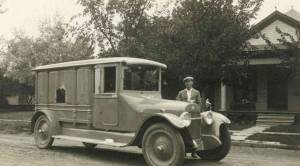 In 1922, Fred Simmons joined in a partnership with J.H. (Harve) Rice and established the Simmons-Rice furniture store and mortuary in Smith Center. In the early 1920’s an interest in the mortuary was sold to A.L. Cole who was a licensed undertaker when there was a need for more staff. In 1926, Mr. Cole sold his interest to Arel Olliff. In 1929, the firm bought the mortuary in Kensington and Arel Olliff moved over there to manage the location. 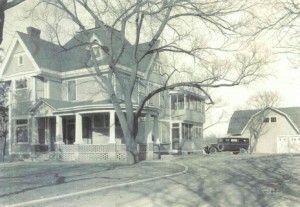 In 1946, the Schultz Funeral home in Phillipsburg was purchased and Arel Olliff moved to Phillipsburg to manage that location. After years of partnerships made and Mr. Rice’s passing, the funeral home took the name of Simmons Mortuary around 1946. At this time Smith county native Carroll Kirkendall was hired to run the Kensington location. Carroll managed Kensington until 1957 when he transferred back to Smith Center. Upon Carroll’s move Fred and his wife built the house directly west of the mortuary. Also upon Carroll’s move, Dale Lambert, another Smith County native, was transferred to run the Kensington location while Fred and Carroll took care of Smith Center. The evidence of Fred Simmons’ being a successful entrepreneur was evident with the construction of buildings and improvements on the grounds where the funeral home sits. Fred Simmons passed away peacefully in 1967 after running his usual errands at the furniture store. While looking through history of the mortuary, Adam has always been amazed that the majority of the staff have been hometown people who the community trusted with good reason, Fred Simmons, Carroll Kirkendall, Dale Lambert, Jim Kirchner and Dane Scherling to name a few. There isn’t a much better way to provide the local communities with the traditional service they deserve. Early 2007 brought new ownership of the mortuary to yet another hometown family. New owners Adam & Merissa Rentschler along with the hiring of another lifelong community member David Tharp in 2007, and the hiring of Dairiane (Schoen) Cobb in 2019 the tradition will continue with superior, honest, trustworthy and meaningful service with the goal of helping families begin to heal.